This was my first experience with reading a Kasie West book, and I’m so glad that I got to share it with some of my lovely book friends! Sarah, of course, as well as Mandy from Book Princess Reviews, and my friend Aurora, the best book pen pal a girl could ask for! I can’t think of a more perfect book for a buddy read or for the season! 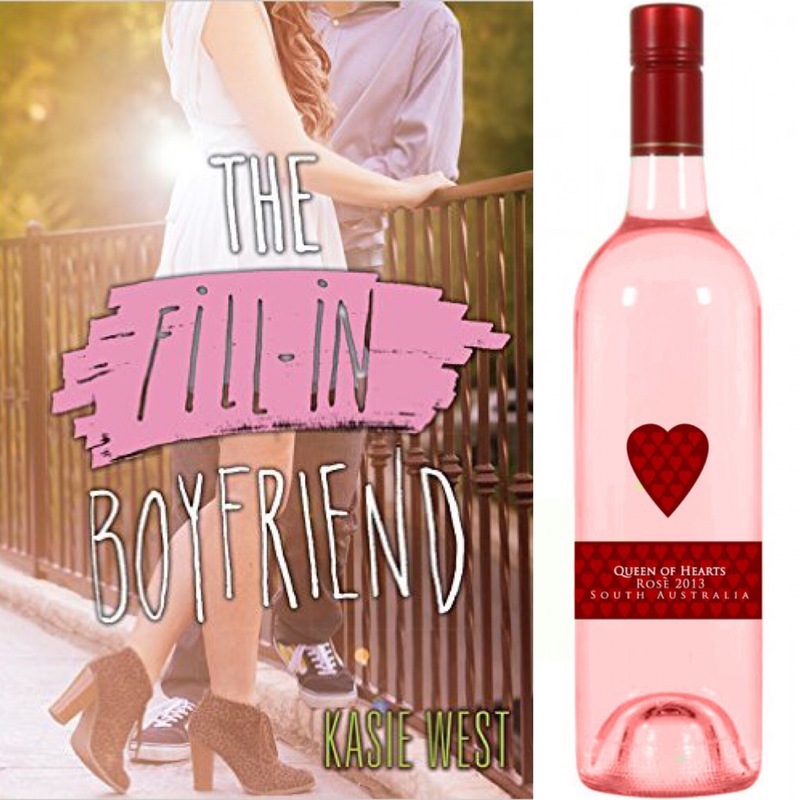 The Fill-In Boyfriend is sweet and swoony, and West has put her own twists on some classic YA rom-com tropes and really made it her own. The Fill-In Boyfriend simply must be paired with something as sweet and adorable as the story itself, so I chose this adorable Queen of Hearts Rose! This delightful wine has a “crisp, and well-balanced finish,” which is exactly how I would describe the ending of Gia and “Bradley’s” story. Instead of typing up bits of our discussion, I thought I’d post some screenshot highlights of our conversation instead. WARNING: SPOILERS AHEADS! Reading a First Kasie West Book!!! Which West Will You Read Next? So that’s our buddy read! Have you guys read The Fill-In Boyfriend before? What did you think of it? What is your favorite West? If & Then Thursdays: Pirates and High-Seas Adventures! I BELIEVE IN A THING CALLED LOVE is sweet, swoony and oh, so much fun! Creative way of reviewing! May try out this book! Thanks so much! That is definitely what I’m hearing from people. It is definitely going on my list! Oh, good! It kind of took forever to do these screen shots. LOL! I haven’t tried this one! This is one of those books I did on audio while commuting/working, so not a time when I could actually drink the wine sadly, but it is so cute! I really want to try it! What a great way to post the convo! Ahh this book is on my Summer TBR! I’m glad to see that you’ve liked it and gave it 4 stars, now I can’t wait to pick it up! Oh, good! I’m glad I FINALLY got around to reading some Kasie West. She is definitely going to be a go-to author for me now when I’m in the mood for fluffy contemporaries. 🙂 Can’t wait to see what you think when you read it! This is awesome! I’ve heard of Kasie West but haven’t gotten around to reading any of her books yet. I hadn’t read any of her stuff before either, and I’ve been meaning to forever! She is definitely going to be an auto-buy author for me going forward. First of all: Yay for Rosé season!! I’m so excited to see them popping back up in the stores. There’s something so summery about a good rosé. Second of all, I *adore* this format for a collab post. I might steal it for a future collab I have planned… 😉 After all, imitation is the highest form of flattery. 😀 I also haven’t read a West book before. That said, I skimmed this post to avoid spoilers. I look forward to trying it; you haven’t led me astray yet, Krysti! That’s brave of you! But it also means that I can’t judge you if it doesn’t work out for me. 😉 P.S I Like You it is, then! But, the 5th Wave comes first. Gotta prioritize. I adore conversing about books. Oh, I’m so glad to hear that you enjoyed it as well! We had so much fun reading it. I cannot wait to read another one of her books! This was so fun to read. I think I need to try both the book and the wine! Love this!! Well, now there is a fascinating theory that could become an awesome blog post. Finding the Souls of Kasie West’s Characters Through the Images of Their Feet. I enjoyed this book as well. I like The author’s work. It’s not too dramatic or sappy.